Researchers suggest that dramatic reductions in pollution could be achieved simply by retiming traffic lights. Cars and trucks cause more than half of the state's carbon monoxide and hydrocarbon pollution, according to the Minnesota Pollution Control Agency, and that pollution and wasted energy is never greater than when we stop, idle and start at stop lights. There aren't just too many signals. Minnesota Department of Transportation metro traffic engineer Steve Misgen said the lights at some of the nearly 2,000 Twin Cities signalized intersections haven't been timed for years. "A lot of these signals get put in and basically nothing happens to them for the remainder of its life," Misgen said. Researchers at Oak Ridge National Laboratory assert that, across the nation, traffic signal re-timing programs have resulted in travel time and delay reductions of 5 to 20 percent and fuel savings of 10 to 15 percent. Another research group says better management of the country's 272,000 traffic signals would cut emissions of carbon monoxide and other pollutants by 22 percent. Some signals in Minneapolis haven't been re-timed for current traffic conditions in nearly 20 years, according to Minneapolis traffic engineer Don Sobania. The reason? Not enough money and staff. Sobania says the return on investment as measured by the value of the gasoline saved and pollution avoided is significant. "The payback period for spending staff time is someplace under a year in user costs if you invested in signal timing," he said. About 700 of the nearly 2,000 traffic signals in the Twin Cities are controlled by the Minnesota Department of Transportation, according to state officials. MnDOT's Metro traffic engineer Steve Misgen and his staff re-time the lights they control every two to three years. They also make improvements - installing newer signals and more traffic monitoring equipment, Misgen said. For example, next week MnDOT will activate new traffic monitoring cameras and sensors on a stretch of state Highway 13 in the southern Twin Cities. If the equipment doesn't detect cross traffic, there'll be fewer red lights and smoother traffic flow. The goal is to do the same for Highway 55 in the western suburbs next year, Misgen said. "On Highway 55 we have 24 signals in a corridor," Misgen said. "We only can look at those one at a time. This new system will allow us to look at all of them all at the same time." The other problem impeding smoother Twin Cities traffic flow is too many cooks in the kitchen, according to the John Hourdos, a University of Minnesota engineering professor and traffic expert. Hourdos, a native of Athens, Greece, said, unlike major European cities and some larger American ones, most Twin Cities road signals are controlled by the cities and counties that install them. "And everybody in its little world is coordinating," he said. But not coordinating with each other. Hourdos predicts that in 20 years, vehicles will talk with one another via computer as they approach an intersection, modifying their speeds so they don't have to stop. "And like a nice ballet dance, every car will cross each other's path safely," he said. That gee-whiz auto technology doesn't address what Hourdos said is a bigger issue. Sprawl has created a reliance on personal vehicles that he said is unsustainable. "If you want to go buy a tomato you have to drive for it," he said. 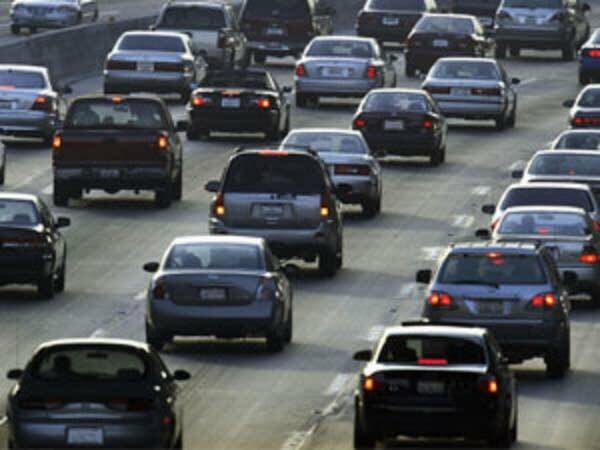 Instead of reacting to traffic problems we need to plan how urban areas develop so people don't have to drive so much, Hourdos said. The transportation group asserts retiming lights results in significant fuel savings and pollution reduction. The Minnesota Pollution Control Agency works with the Environmental Protection Agency to enforce air quality standards, and reduce motor vehicle pollution.